Learn how the pictures on this web site were prepared, learn how to use Photoshop as a “digital darkroom” for making handmade enlargements of your photographs! Tips, hints and advice from a professional photographer working in Paris. Regardez cette page en français. We’re all quite happy with the technical capabilities of cameras these days and their ability to capture the finest of details, though sometimes it’s best to do a bit of clean up work so as to end up with a truly flattering portrait. Brightness, color and contrast adjustments: To make the best of prints with detail everywhere, it’s best to take pictures a bit “flat”, without much contrast, with the exposure optimized for the highlights. 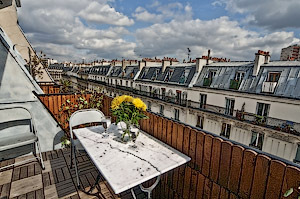 Hover over this picture of a balcony terrace on rue Beaurepaire to see the picture as I took it. 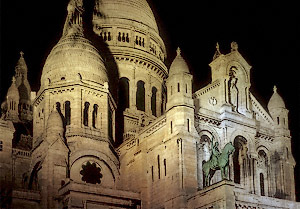 Perspective correction: hover over this picture of Sacré-Cœur to see the uncorrected version. Digital trickery: remove bothersome elements from your pictures as you wish! Hover over this picture to see the truck disappear; take a look at a bigger version of this example. Image sharpness optimized for display on a web page. Hover over this picture to see the results of a reduction from a high-resolution scan, without boosting the sharpness. 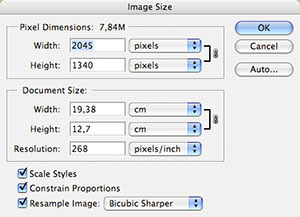 The “Image Size” dialogue box where you can set the print size, and if necessary, the number of pixels in the image. The “Curves” dialogue box is the best choice for working on the brightness, contrast, and color balance in a photograph. I prefer this method by far as opposed to others, notably Levels. 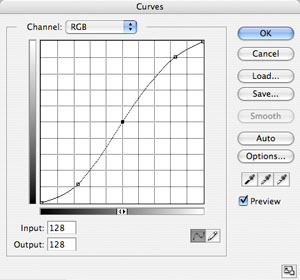 This screen shot shows a typical curve for increasing the contrast of a picture. 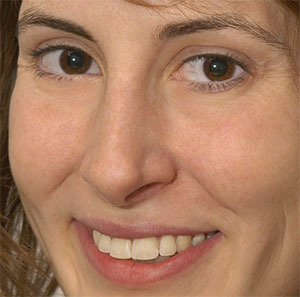 Portraits: How to minimize skin disturbances, shadows around the eyes, wrinkles, acne, freckles, the “five o’clock shadow”, without losing apparent sharpness. Bring out the best in your portraits while avoiding the “silly putty” look, or pictures that look too much like those on the covers of teen/glamour magazines. Brightness, contrast and color balance: how to adjust these three at the same time, or separately, with the “Curves” dialogue box, with which one can modify colors in a “non linear” manner, which the “Levels” dialogue box does not allow. Nighttime photography: photographs taken at night or inside often have an overall red or yellow cast because of artificial light, such as tungsten bulbs. Learn to correct these color casts without making areas of the picture too blue or cyan. Perspective: Straighten out converging lines in pictures taken with the camera pointed up or down. 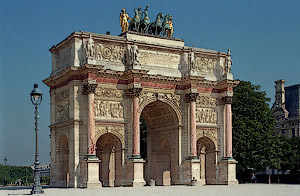 Pictures of buildings generally have “keystone” distortion, unless the picture is taken with the focal plane parallel to the building façade. Before the arrival of digital photo retouching, the only solution was either to use a perspective-correcting lens, or to take pictures with a large format field camera. Selections: Just about always, you’ll want to modify brightness, contrast and color balance region by region. To do so, you need to make selections: with the polygonal Lasso tool, in “Quick Mask” mode, with the “Color Range” command, or with a combination of these three methods. The subject of selections is perhaps the most complex and the most difficult to understand, so much so that sometimes it’s better to skip it and use the “History Brush”, to return the areas on which you click as they were when you opened the file. Digital trickery… This isn’t really my thing, and I try to take my pictures such that I won’t need to work them over much in Photoshop. That said, from time to time I do find myself removing trees rising from behind people’s heads, towing away bothersome trucks, picking up litter on sidewalks, etc. Sharpness: How to increase the visual sharpness of your pictures without going too far. These days I see pictures (in photography magazines, even!) whose sharpness has been pushed too far. Usually this is noticeable because there are thin white lines along the edges between bright and dark areas. Image size: How to set the resolution for a given print size, learn when you should “up-sample” so as to avoid seeing pixels in an enlargement, or downsample to reduce file size. Eliminate “noise” and reduce film grain: Until the release of Photoshop CS2 I used the “Dust and Scratches” filter, now we have the “Reduce Noise” command, though such filters should just about always be applied selectively so as not to lose detail, using layers and the Eraser tool. Calibrate your screen and the rest of your digital photography process: It is essential to be able to trust the colors and contrast displayed on your computer so as to be able to make prints that resemble what you see on the screen. This isn’t just a question of calibrating the monitor; the settings on your camera or scanner should be looked over, as well as your printer if you make your own prints. Learn about file formats: In digital photography we have Tiff, Jpeg, Photoshop, Raw and Gif. Tiff offers little or no options for compression, keeps all the quality of an image, JPEG offers variable compromises between file size and image quality, the native Photoshop format should be used when working with layers, the Raw format is generated by digital cameras and is thus an import format, PNG format is useful for preparing images for web pages with a non-rectangular border and a transparent background, and the only reason for using the GIF format is for creating slideshows and animations. Learn how to use these formats, when and why. 16 bit mode: Images with this color depth have an extended range of brightness values as compared to 8 bit files, albeit “hidden behind” the eight bits that computer monitors display. The great advantage of 16 bits is that one can more easily recover details otherwise hidden in the highlights and shadows, above all in pictures with a lot of contrast. Photo labs do not accept 16 bit files, and the JPEG format only allows 8 bits. I take my pictures in the Raw file format, which allows me to open them in 16 bits, giving that much more depth and exposure latitude. Once I’m finished working on the picture, I switch to 8 bits, and save the image in JPEG format in order to archive it, or send it for printing. Prepare pictures for display on web pages: Oddly enough, it isn’t enough to reduce images with the “Image Size” dialogue box. It’s better to do the reductions (twice if working from high resolution images, bigger than 2,000 x 3,000 pixels), while boosting the sharpness with each reduction. Also, I’ve occasionally found it necessary to brighten the image before making the final reduction as so many original pixels are being glommed together in order to interpolate the web version’s pixels. Write me a note if you would like to sign up for Photoshop lessons! 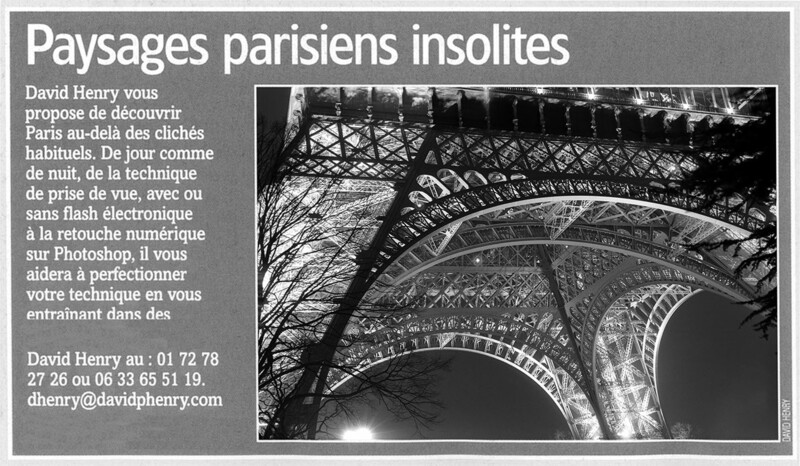 Above: an announcement for photography lessons by David Henry printed on page 154, in the October 2005 edition of one of the leading photography magazines in France. I’ve been taking pictures since the age of thirteen. Most of my work consists of tourism and travel photography, for advertising agencies, graphic designers, architects, books, magazines and other kinds of publications. I first started digitally manipulating photographs at the beginning of the 1990s. A few years later I was preparing pictures in layouts for high-resolution offset printing. The great leap forward occurred in February 2001, when I bought a film scanner and a computer up to the task, worthy of making prints of truly photographic quality, at very large sizes. Why retouch pictures, why Photoshop? A typical scene with lots of contrast: It’s frustrating to not be able to expose for the foreground and the background at the same time. 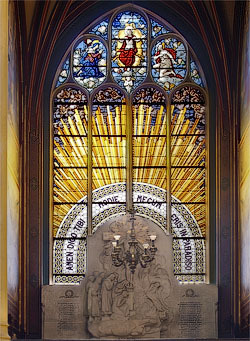 In this example, the easiest way is to take one picture exposed for the stained glass window, and another exposed for the interior of the church, and to combine the best of the two images. Along the way, I corrected the perspective in this picture also. Of course one can have pictures taken with a digital camera printed without doing the least bit of retouching. And if the pictures have been exposed well enough, many of them will come out fine. In the history of photography, truly the best prints are ones made by hand by someone with an enlarger. Seventy years ago there was no such thing as “custom printing”, because automatic printing machines had not been invented and every print was made by hand in a darkroom. It’s impossible to print digital pictures with an enlarger, so to do your custom color printing, Photoshop is necessary. Doesn’t the term “retouching”, imply trickery or cheating? For twenty years I developed my negatives and made black and white prints in the darkroom with my enlarger. When doing so, I systematically made areas lighter or darker, activities known as burning and dodging. When I started using a scanner and Photoshop to make my prints, I retained these same habits, except that now I can do all this in color, something too difficult, slow and expensive to do in a darkroom. 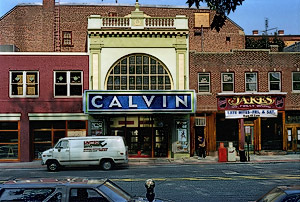 I have retouched all the pictures you see on this web site, some more than others, but always in the spirit of making “custom, hand-made prints”, as opposed to machine-made prints. I’ve found that any digital image benefits from a boost in sharpness, adjustments of color balance, and above all, pulling out details in the highlights and shadows. Doctoring pictures isn’t my thing, and I don’t often engage in what could properly be called trickery, beyond picking up litter or removing trees rising up behind people’s heads. That said, I know perfectly well how to completely doctor photographs, there are a few examples at the bottom of this page. What kind of equipment is necessary? Just about any computer made in the last ten years can run Photoshop, as long as it has enough RAM (two gigabytes is a comfortable minimum) and has at least a dozen gigabytes of free space on the hard drive. If you do not have Photoshop installed, Adobe offers a trial version which lasts 30 days. If you will be using Photoshop more than a little bit, I strongly recommend a graphic tablet, like those made by Wacom. When are the Photoshop lessons held? Workshop sessions are in no way pre-organized, they are scheduled according to your availability. It is best to reserve sessions a few weeks in advance, to make sure I will be in Paris, and not previously engaged. You may look over available dates, below. What previous skills and knowledge are required for participants? I work with people of all kinds of skill levels, from absolute beginners to people who know Photoshop better than I do in certain ways. Participants need not know anything about digital photography, the only requirement is a will to learn, and the motivation to put in to practice the ideas and concepts I teach. 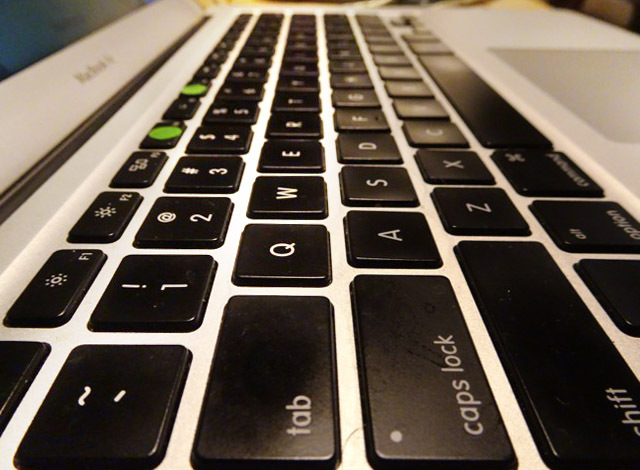 The keyboard of my 13-inch MacBook Air equipped with Photoshop CC and Adobe’s other leading programs: Lightroom, Illustrator, Dreamweaver and InDesign. Where are these Photoshop classes taught? I feel it’s best to teach and learn on your own equipment. That way, I can look over your digital photography process from beginning to end; from image acquisition (your digital camera or scanner), your computer and the calibration of your monitor, on up to your printer, or your habits of working with digital photo labs. Otherwise, I can teach anywhere with my MacBook Air and Photoshop CC. I’m in the habit of starting at 11:00 am and continuing until 7:00 pm, though we can start whenever you wish: lessons can be arranged any time: the morning, at night, during the week, the afternoon, on weekends. It must be said that Photoshop is truly a flexible program, used for dozens of kinds of work on images, having to do with science, graphic arts, cartoons, astronomy, video, etc, as well as… photography. If you take traditional classes on Photoshop, you’re likely to learn plenty of things of no interest to photographers: typography, vectorial drawing, drop shadows, “artistic” filters. My approach is to teach Photoshop for photographers, the most important parts of the program for bringing out the best in your pictures, as you would if working with an enlarger in a darkroom. There is just one participant: you! That is, unless you would like to participate with friends, in which case the rates are the same. These workshops are entirely customized, one-on-one sessions. You may think of these sessions as an opportunity to learn techniques I have gathered over the years and to “pick my brains”, and ask specific questions that most people wouldn’t have the answer to. What about Adobe’s other programs? I know InDesign about as well as Photoshop, it’s a fantastic page layout program and entirely essential when you are working on projects that are more than a few pages long. I know Lightroom equally well, it has the same “engine” and technology as Photoshop though the interface is very different. One can spend dozens of minutes making pictures look great in Photoshop though spending this much time on pictures is out of the question when you have dozens or hundreds of photographs to prepare and send out. Thus Lightroom is much more adapted to digital photography, while Photoshop after all dates back to before digital cameras were invented, when image files were created with scanners, not cameras. For “deep digital drawing” and graphic design Illustrator is essential, and I know that program almost as well as Photoshop. A surveillance camera on the façade of the Crédit Municipal bank, next to the motto of the French Republic: «Liberté, Égalité, Fraternité». Here is the picture as I took it, and the Surveillé and Fiché versions. The selfie craze is silly enough, though the selfie stick is all the more idiotic and ridiculous, inspiring me to cobble this montage together for the fun of it. 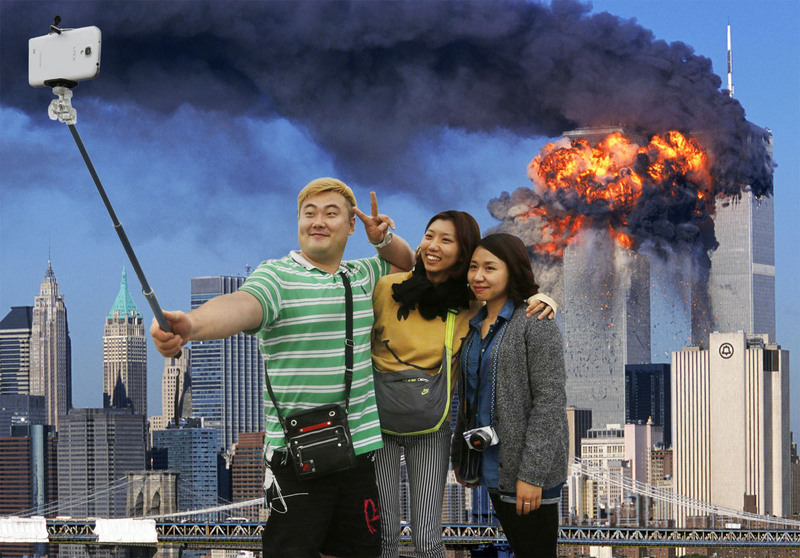 Here is the background picture taken on September 11th 2001, the three Koreans in front of the United States capital building, the Koreans cut out from the background of the source image, and the collage of these two images put together. A photo of me on a Harley Davidson on a very hot day in Budapest. Aside from the usual improvements in overall brightness and contrast, I fixed my posture, brightened my face, darkened my body, fixed my hair, removed a few wrinkles, and enlarged my biceps a bit. Here is the picture as taken and my doctored version. This isn’t my thing though someone asked me to, so why not. Here’s the photo as taken, and my doctored version. Here I removed that nasty cast shadow coming from the internal flash. I always take portraits with an external flash off-camera and diffused, which allows one to keep the flash above the lens and the subject. Here is the picture as I took it and the modified version. I made myself look like I did in the early 1990s in this picture of me with my brothers at a wedding taken in October 2017. Aside from that I also darkened the overexposed areas in the background. Here is the picture as taken and the doctored version. A portrait on île de la Cité of Manu and Yun Jiang in Paris: I found the shallow depth of field quite frustrating, luckily I had taken another picture where I had focused on Manu, so I was able to copy his head and paste him in to the photo where Yun is sharp. Here is the base photo before doctoring, and the montage of the two pictures. To wrap things up I did the classic beauty treatment to smooth out the skin without blurring it, remove the reflections on the skin, and thicken Manu’s hair. I update this calendar each time there is a reservation or a cancellation. Please note: the days marked in red are ones where I have at least one appointment. I am generally free by 7:00 pm on days when I have just one appointment, so don’t hesitate to inquire if you are only available for a workshop on a day indicated in red; I’ll be away on vacation the days shown in white.